Around Easter time in 2004 I was fortunate enough to travel to North Eastern India on a fish collecting trip with the aforementioned ichthyologist and the Finn Antti Vourela, a great travelling companion and pretty decent photographer to boot. The main objective was, of course, the study of catfishes. Our host, guide, entertainer, fixer and all-round good chap was Andrew Rao of Malabar Tropicals. Andrew proved not only to be an aquarium fish exporter, but a naturalist with an extensive knowledge of the area and its fishes and waters. An awesome team. Getting to India from Scotland is surprisingly easy. I live close to Edinburgh airport and the 55 minute hop down to London Heathrow is a well-trodden business path for me. The direct flight from Heathrow was to Kolkata (Calcutta) where I would meet Andrew. I had a narrow scrape with misfortune as I left my trusty collecting trip hat (which has been to every continent that has catfishes) at the gate. Fortunately, a proactive ground crew member spotted it and brought it on-board as the cabin door closed — whew! The overnight flight was packed, mostly with Indians and so felt already exotic to me. It was great; I recall having a splendid conversation with a university student returning home who spent a long time discussing the observations of my Lonely Planet guide on his home town and surrounding area. I was already immersed. Even the most experienced of travellers make a spectacular mess of things from time to time. On arrival in Kolkata's airport I enjoyed the warm, different-smelling early morning air. I picked up my distinctive rucksack, met Andrew and headed off to a hotel to rest; it was already getting hot outside. I had a short nap and on awakening decided brushing my teeth was a good idea. I cannot adequately describe the sinking horror visited on my sleepy head when opening the rucksack yielded only unfamiliar belongings. I had currency, meds, camera and field laptop to hand but everything else was not with me. I had picked up an identical rucksack belonging to someone else from the baggage reclaim carousel . International phone calls, bladder torturing taxi rides (including experiencing one-way roads changing direction at noon — at least for the cars — the buses just ploughed on) and an exploration of Kolkata airport to find the British Airways office ensued. Mercifully, I was re-united with my bag. On the considerably more relaxed taxi ride back to the hotel, I hoped that the fact I'd put some money and Scottish candy deep in the other rucksack would go some way towards making up for my mistake. The next day charged into being with an early morning wake-up to catch an internal flight to Bagdogra in northern Bengal, some 500 kilometres almost directly north from the Bay of Bengal. From there it would be a slow jeep ride of a little less than 100 kilometres to Kalimpong, our first base camp in the foothills of the Himalayas. 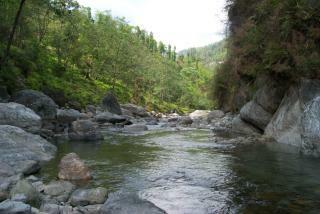 As we drove our route to Kalimpong we saw and followed the course of the Tista River upstream. The Tista collects its waters from the eastern Himalayas, from the northern Indian state of Sikkim until nearly touching the borders of Nepal and Tibet. In April the end of the dry season approaches and so the two-three hundred meters wide riverbed had water for less than a hundred meters width. Sometimes we saw almost dry riverbeds — this is quite normal in India. The great seasonal nature of the climate alters water levels so much that some channels are just for the waters of rainy monsoon season. The biggest rains fall in the summer, July being the month of heaviest rains. As we drove further the landscape grew hillier, the valley of the river plunged deeper and the river itself narrowedr. The water looked more greenish and was now fast flowing. Even the people started looking different. Typical Indian features started mingling with the Asian aspect of the Nepalese as faces flashed by at the roadside. Reddish cheeks became more evident in these faces as we climbed higher and higher. Kalimpong is situated at 1500 meters elevation above sea level. It was formerly a retreat for the British from the heat of Kolkata, a so-called hill-station. Our base camp was a small, hilltop hotel that had stood since the time of the British. It really was significantly cooler: in the evening the temperature dropped to less than 15 degrees, and this was the warm season. Next morning we visited a river called Rishi after driving to the border of north-east Bengal and the northern state of Sikkim. The border looked pretty tricky to cross and was delineated by the Rishi. 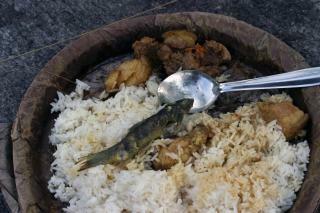 We decided to investigate the river following an excellent second breakfast of momo served at the roadside. At this point the Rishi was neither very wide (10m max.) nor deep (typically less than 60cm) though significantly deeper (2m) in drop pools. The water seemed around 20°C. 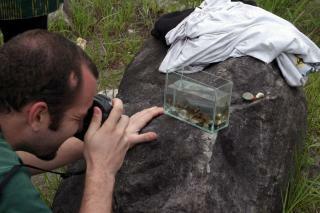 Immediately we found Schistura devdevi loaches here. The first new encounter was Devario aequipinnatus. They shone with a bright turquoise colour on their flanks and contrasting reddish fins. We could see Garra underwater as well. They had quite strange, fierce, or even cruel-looking faces. Many Garra have deep grooves above their mouths giving them peculiar look. The species here was most likely Garra gotyla. 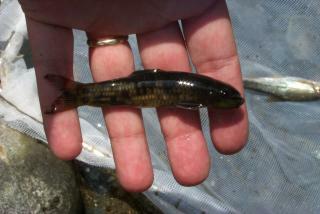 Other interesting species from the Rishi were the salmon-like Schizothorax sp. and Barilius sp. 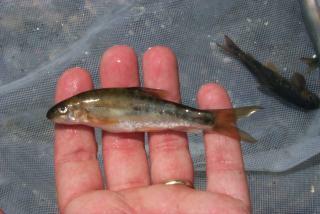 ; both are cyprinids well adapted to fast-flowing waters. We had some help from the local fishermen who were able to catch what was — to me — an unexpected surprise. From the deepest parts with strongest current falling between robust rocks they could catch Pseudecheneis sulcata. These magnificent catfishes are quite large: over 15cm in total length. They had typical colour for the members of this genus, chocolate-brown ground colour with some golden to orange or cream-coloured markings on the fins and body. Despite being a bit more sucker throat rather than suckermouth, these catfish are, to me, the plecos of Asia: they belong to the hillstream catfishes of the family Sisoridae. Their closest relatives are the catfish of the genus Glyptothorax. Both have adhesive organs on their ventral side just behind the mouth. The Pseudecheneis have this organ made of transverse skin folds as Glyptothorax have radiating skin folds, which makes these two genera easy to distinguish. Under a strong microscope these pinkish skin folds are revealed to be hundreds of thousands of micro hooks — nature's Velcro keeps these fishes on their rounded rock homes. Although they do not have as strongly developed a sucker mouth as the plecos of South America, evolution has been hard at work with these fishes. Their mouth is provided with a protective cover (perhaps to keep debris from lessening the effect of the “Velcro”) and even the rays of their substrate-interfacing fin rays are ribbed for grip. It's an amazing animal to look at closely. Some individuals had developed almost batwing like pelvic fins. My hunch is that this is a Chaetostoma-like adaption to guarding adhesive eggs. Aside from the current, there is plenty in the stream to trouble young fishes. Indeed, it crossed my mind more than once that if I were standing in an identical stream in Andean South America, I'd be finding Chaetosoma and Corydoras instead of Pseudecheneis and Garra. After collecting and photographing, we were treated to a lunch of rice with what I thought were vegetables in a light curry and a couple of fried Garra. While tackling this plateful, I considered the fate of the caged chicken which had accompanied us that morning, earmarked for lunch. Such minor mysteries happen all the time on collection trips. Perhaps it was traded for the fishermen's assistance. While the Garra was delicious, the vegetables turned out to be a part of a pig that, to this day, I still haven't identified and proved to be an acquired taste. The strong, warm beer that accompanied this late lunch certainly took the taste away. Aptly branded He Man 3000, just one large brown bottle of this sticky sweet stuff was a challenge in the mid afternoon sun! As far as I can tell, Pseudecheneis had never been exported from North India until a few specimens were exported in early in 2014 which I think was the first ever export. Around forty specimens went from Andrew Rao at Malabar Tropicals to Japan but a couple of individuals ended up in the Netherlands. This current- (perhaps just oxygen-) loving fish would not take well to an overland journey to the very much hotter climate of India's major ornamental fish export hubs. Nor could I anticipate them doing well in typical export facilities. Perhaps we will see species of this genus imported from other countries or perhaps international flights from new, closer, locations will change this. I, for one, would make instant tankspace for it in my fish room — we know nothing of their captive care and I'd like to change that. Type Locality Kasyah [Khasi] Hills, Meghalaya, India. Identification Fishes of the genus Pseudecheneis can be differentiated from other Glyptosternine fish in having a thoracic adhesive apparatus consisting of a series of transverse ridges (laminae) separated by grooves (sulcae) (de Pinna, 1996; Roberts, 1998). Pseudecheneis sulcata can be distinguished from congeners in having a unique combination of the lack of a prominent bony spur on the anterodorsal surface of the first dorsal-fin pterygiophore, presence of a first dorsal-fin element, bifid neural spines on the complex vertebra, the neural spines of the last 2–3 preanal and first 6–7 postanal vertebrae gradually increasing in height, separate pelvic fins, a less convex snout when viewed laterally, presence of pale spots on the body, 36–39 vertebrae, 12–14 transverse laminae on the thoracic adhesive apparatus, pelvic-fin length 21.2–28.7% SL, pectoral-fin length 121.6–156.3 % HL, length of adipose-fin base 17.8–22.7% SL, length of caudal peduncle 25.0–28.3% SL, depth of caudal peduncle 4.0–5.2% SL, and eye diameter 8.8–10.6% HL. Distribution Known from the Brahmaputra River drainage. 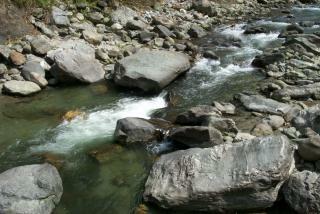 Other Parameters Found in fast-flowing hill streams. Prefers deep riffles and runs over gravel, cobble substrates.